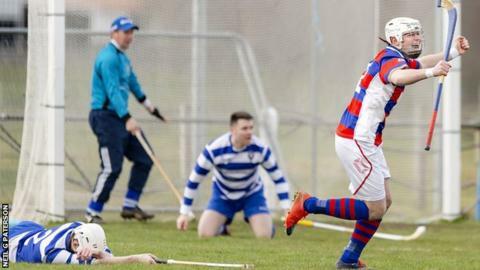 Defending Premiership champions Newtonmore suffered their second defeat in three outings so far when they went down 3-1 at home to local rivals Kingussie on shinty's derby Saturday. Greg Matheson scored a hat-trick as Lovat extended their unbeaten record to four games with an 8-0 hammering of Caberfeidh. Kyles defeated newly promoted Inveraray 3-1 and Kilmallie beat neighbours Lochaber 2-1. Kinlochshiel, the 2017 champions, got their first point in a 1-1 draw with Oban Camanachd in the only non-derby Premiership encounter at Mossfield Park. Savio Genini gave Kingussie a lead that was soon cancelled by Michael Russell. Roddy Young netted Kingussie's second midway through the second half and James Falconer put the points in the bag late on. Martin Mainland's first-minute strike opened the floodgates in Strathpeffer. That was followed by goals from Greg Matheson, Fraser Heath and Lorne MacKay before a Matheson penalty in stoppage time made the half time score 5-0 for Lovat. The game had barely restarted when Cabers were awarded another penalty, converted by dead ball specialist Kevin Bartlett. Matheson completed his hat-trick in advance of contributions from Marc MacLachlan and Chris Johnson then Bartlett's second for the home side. Scott MacDonald fired Kyles in front in the second minute and Lewis MacNicol brought the half time score to 1-1 against Inveraray. MacDonald and Ross MacRae then won it for Kyles. Liam MacDonald put Kilmallie ahead after a goalless first half and Lochaber's Ben Delaney soon equalised before Calum MacDougall's winner for visitors Kilmallie. Oban took the lead just before half-time through Scott MacMillan and Jordan Fraser replied for Kinlochshiel. A spectacular late burst from Fort William kept them top of the National Division and with a 100% record after three games with a 3-2 home win over Skye. Will Cowie got an early opener for the island side, heralding 72 goalless minutes. Alexander MacMillan equalised before Cowie edged Skye ahead again with five minutes left. However, Lachie Shaw and Padraig MacNeil turned the game on its head for Fort at the death. Glenurquhart, also on 100% but with a game in hand, remained in pursuit with a 9-0 drubbing of Oban Celtic in Drumnadrochit, where James MacPherson got a hat-trick and three different players scored doubles. The other National fixture ended goalless between Bute and Glasgow Mid Argyll.